I only have one more kind to make which I'll do next week along with the pies, cheese balls and crab salad. That way each of the four kids has enough nibblies to share with drop ins at their homes! and overnite shipping to Texas is next, right?! 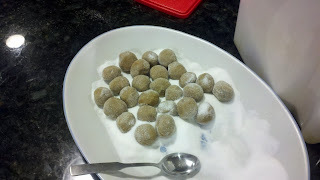 peanut butter balls! yum! I'm seeing peanut butter, chocolate, sugar, coconut....the most important food groups represented here. I keep forgetting to come check what you are doing because i still can't get you in my reader or on my side bar. arrrh. these and the choc chip look divine.